Retired Police Officer, Michael James Reiter, passed away on July 28, 2018, in Modesto, CA, while surrounded by his loving family. He was born on March 2, 1953 in Saint Paul Minnesota, and was a resident of Lathrop and Manteca, CA, for 27 years. Mike knew when he passed away from this world that he would be with the Lord, and all of his loved ones that went to Heaven prior to him. His Christian faith was strong as he loved serving the Lord at Liberty Baptist Church in Manteca. Mike dedicated his life to law enforcement. 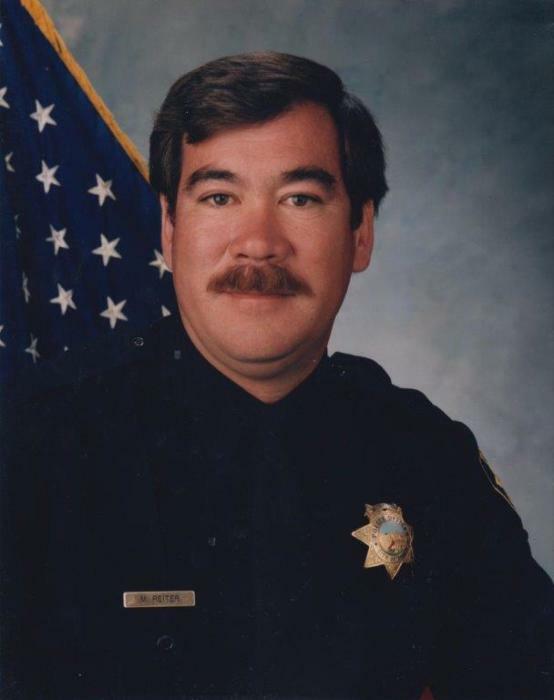 He worked as a motor patrol Police Officer for the Tracy Police Department for 25 years until his retirement in 2008. After retirement he continued to work as a police officer for San Joaquin Delta College in Stockton. Mike worked at the college for two years with three of his good friends; Vence, Bob and his very best friend of 40 years, Dave Main. He loved his work, maintaining law and order, and was very proud to serve on the P.D. He was preceded in death by his parents; Mineko Itoh and Richard Adolph Reiter. Mike is survived by his loving wife of 25 years, Becky Reiter, his two children; Jenni (Mark) Parker of Manteca and Jeffrey (Tonya) Buchanan of Jackson. He was blessed with seven grandchildren; Jordan, Nolan, Mackenzie, Nevin, Joshua, Samantha and Maci-Mae all of whom he loved dearly. Also surviving Mike is his father-in-law, Eddie Haffer, two brother-in-laws (Eddie Albert Haffer and Robbie Haffer) and one sister-in-law (Terri Burton). Mike leaves behind his twin brother, Matthew John Reiter, whom he truly loved more than anything; always knowing that if either of them needed the other, they would each be there. He also leaves his sister-in-law, Gaby, nephews, Kevin, Scotty and Andy, and his beautiful niece Laurie. Spending time with his grandchildren was one of his great joys. He loved watching their sporting events, taking them to the movies, Saturday morning donuts, and getting slurpees on hot summer days. The Reiter Family would like to thank all of the doctors, nurses, home health care and medical teams including the Dialysis centers, who cared for him and brought hope and sunlight to Mike and the family each and every day. And a special thank you to all of those who were a part of Mike’s life. P.L. Fry & Son Chapel is honored to be serving the Reiter Family. Visitation will be held on Sunday, August 12, 2018, from 1:00 P.M. to 5:00 P.M. at P.L. Fry & Son Chapel, 290 N. Union Rd., Manteca. A Funeral Service will be Monday, August 13, 2018, at 11:00 A.M. at Calvary Community Church, 815 W. Lathrop Rd., Manteca. An online guest book is available for condolences to the family at www.plfryandson.com.